Dad and I went to Oakland Chinatown to grab lunch, and we decided to stop at Tian Jin Dumplings and order something to-go. Tian Jin Dumplings isn’t your usual sit-down restaurant. Orders are made and received through a window, where you can also have a peek at the kitchen and see a crepe griddle/maker! Tian Jin Dumplings has mostly dumplings as the shop’s name implies, but there was one item on the window that caught my attention. 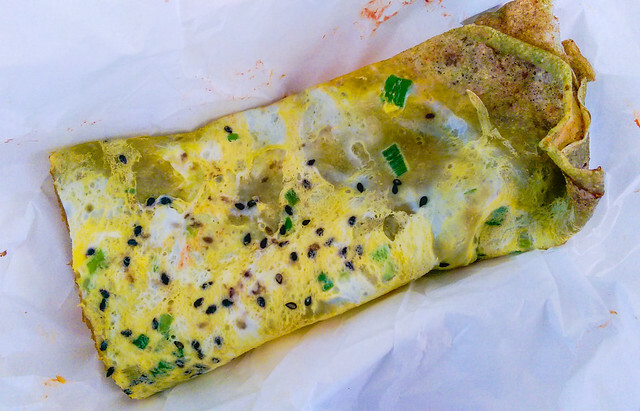 It said “Savor Tianjin Crepe (Salty)” with the ingredients egg, green onion, Chinese donut, parsley, preserved vegetable, sesame, sweet flour sauce, chili sauce, for $4.45 USD. I asked how big it was, and the lady held her arms out! I ordered only one, to share with Dad. I also got to see the chef make the crepe! He first placed the batter on the griddle to make the crepe first and flipped it to cook the other side. Then he added two long pieces of Chinese donut (youtiao) in the middle, rolled it up, and cut it in half. The entire cooking process took less than a minute! You can eat it on the spot, or take it home. But the earlier you eat it, the better, while the Chinese donut is still crispy. Tianjin is the birthplace of the egg crepe/pancake (jianbing 煎饼), known as jianbing guozi 煎饼果子 there. 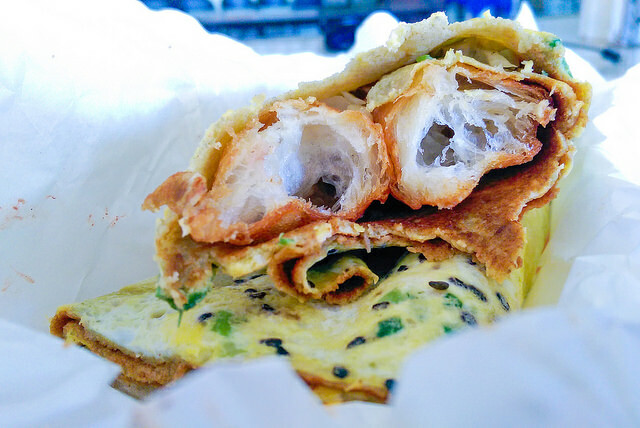 In Tianjin, jianbing are ‘handled’ a great deal more than their Beijing brethen: vendors use their fingers to flip the pancake; crack and press down the crispy fried dough in the center; fold up the crepe and shove it into the bag. They also tend to put the sauces (fermented wheat paste tianmianjiang 甜面酱, whipped red pickled tofu nanru or hong doufuru 南乳／红豆腐乳, and chili paste lajiang 辣酱) on half rather than the entire surface area of the crepe-bing.